A hutong is a type of narrow alley unique to Beijing, and a popular must-see for tourists who visit the Chinese city. A hutong is a type of narrow alleyway found in cities of the north of China, particularly in Beijing. The hutongs located in Beijing are formed by lines of siheyuan, which is a type of residence where houses are purposely built to form squares or rectangles in order to create a type of traditional courtyard. Most of the neighborhoods within the area and throughout China were formed by joining one siheyuan to another to form a hutong, which is then joined to another hutong. As of mid 20th century, several hutongs in Beijing had been torn down to pave way for the development of infrastructure. However, thanks to efforts designed to safeguard this significant aspect of the Chinese architectural culture, many hutongs have been preserved. Hutongs, (which translates roughly to "water well" form Mongolian) first appeared during the Yuan Dynasty. The design is thought to have originated from Mongolia. Much of residential Beijing was organized by different social classes throughout the time of the Zhou Dynasty, the longest of China's dynasties that lasted from the years 1046 BCE to 256 BCE. Citizens who were higher on the social class rankings were allowed to live near the center of the circles. The aristocrats resided in the western and eastern sides of the Imperial Palace. The siheyuan of such officials who had high rankings together with wealthy merchants were large and characterized by beautifully painted and carved pillars and roof beams with exquisitely landscaped gardens. If one enjoyed a high position in society, their Hutongs were well aligned with walled gardens and homes with ample space. 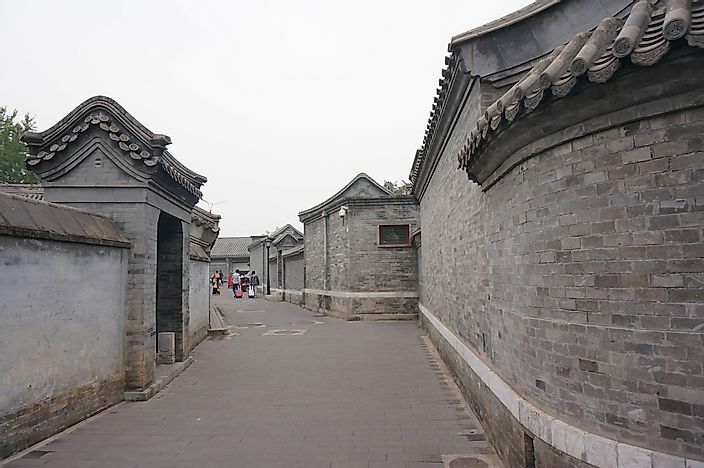 However, far away from the palace, laborers, commoners, artisans and less wealthy merchants lived in much smaller and simpler siheyuan forming narrower hutongs. The main houses and gates of most siheyuan faced the south for better lighting and thus a number of hutongs run from the east to the west with several tiny lanes from north and south enabling easy passage. As the era of dynasties were coming to an end, the role of hutongs within society changed as well. The main reason was that many of the newer hutongs had been constructed with no proper plan and had begun to crumble quickly. Back in the city center, aging hutongs were beginning to crumble due to lack of maintenance. Many areas which had the highest concentration of hutongs were destroyed between 1911 and 1948. As a whole, the city of Beijing was deteriorating, and many of the siheyuan which had earlier been owned and occupied by small families were divided and shared among many households. Most of the old hutongs of Beijing have disappeared, and have been replaced by high-rises and wide boulevards since the 1949 establishment of the People's Republic of China. Most of the residents whose families have lived there for decades left the area for the construction of modern apartments. For example, in Xicheng District almost 200 of the 820 hutongs it once accommodated in 1949 have long since disappeared. However, some hutongs do still exist within Beijing and remain an important element of tourism in the city. Some are several hundred years old, and in some locations they are preserved alongside recreated contemporary hutongs. The area is frequented by tourists, most of whom tour the quarter in small local means of transportation known as pedicabs.